Offering B.F.A. and B.S. 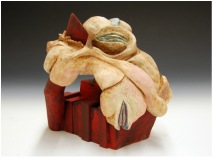 degrees, the ceramics program prepares students to produce work of professional competence in various clay media focusing on mastery of relevant technical skills and creative expression with a strong emphasis on concept, craftsmanship, design, and aesthetics. We offer wheel-throwing, handbuilding, mold making, slip-casting, clay formulation, glaze formulation, kiln theory, and studio practice. Our focus is to promote creativity, conceptual development and individual expression in both functional and sculptural ceramics.